Capitalism - A System of Competition? Many of capitalism’s most vocal advocates have, themselves, imbibed this premise uncritically. They leap to a fervent defences of competition, extolling its virtues – real or perceived. In my view this is a mistake. To accept without evaluation the presupposition that capitalism is a system of competition – in contrast to other hypothetical systems of cooperation (namely socialism and communism) – is to frame the very debate itself in leftist terms and play the game on an unfairly tilted game-board. This is not to say that those who defend competition do not raise some worthy points. For example: If not competition, then what is the alternative? Is there to be one central provider of each good and service available who gets to decide on our behalf how it is best to be produced and then allocated? Add to that, that if competition is wrong in the market, then why not in the political sphere? Surely democracy is out of the question if competition is a corrupting factor, because what do political candidates do if not compete for office? Think of the competition this generates between political parties, not to mention the ensuing competition between firms and individuals for preferential treatment from politicians and legislators, competition between lobbyists, think-tanks, and voters, to receive benefits out of the public purse. If the free and voluntary section of society is a system of competition, how much more so is government? Surely democracy is a “system of competition.” Politicians are competing for the very machinations of control in our society. For the right to pass and enforce laws which apply to everyone (whether they agree with them or not) and to force them to pay for their enforcement. They are not simply competing for market share where the winner of the competition is the one that satisfies the most demand. We can sidestep the more mundane economic arguments in favour of competition for the moment, such as the case that it increases efficiency and cheapens goods while driving innovation, as we are all familiar with them already. Nonetheless, parsing what is essentially a sociological debate – a meditation upon the effects of an economic environment upon the soul of man – in socialist terms; basing it upon left-wing premises without examining their foundation is to cede too much ground. A comical equivalent would be for a leftist responding to the clichéd assertion of the American right that “Hitler was a Socialist!” by arguing that many of his labour policies were successful in improving social conditions for the working class. This is not to say that competition is necessarily an evil either. The problem lies in defining capitalism as “a system of competition” - in comparison to other systems which are somehow “cooperative”; that is a rhetorical ploy. Those who profess it may honestly believe it to be so, but it’s not true. Capitalism is not “a system of competition” any more than any other system. Capitalism (at least in its free-market, laissez faire ideal) is a system of the voluntary exchange of goods and services in the absence of physical coercion, theft, compulsion or fraud, predicated upon the fundamental right to own and accumulate property. One might even venture, therefore, that capitalism is a system of voluntary cooperation. Granted, this definition still leaves room to debate the morality of accumulating property. Or perhaps whether the “negative” right to ownership when it comes to the rich should take precedence over the “positive” right to healthcare or education at their expense when it comes to the poor. We can even debate whether the relationship between capitalists and their employees are really free of coercion given the power disparity between the two groups. Indeed these are debates I delight in exploring further. However, there is no justification for defining capitalism as a system based upon competition. Competition is a feature of living in a world of scarcity and would exist in any system. Socialism cannot do away with competition – nor can any other system. 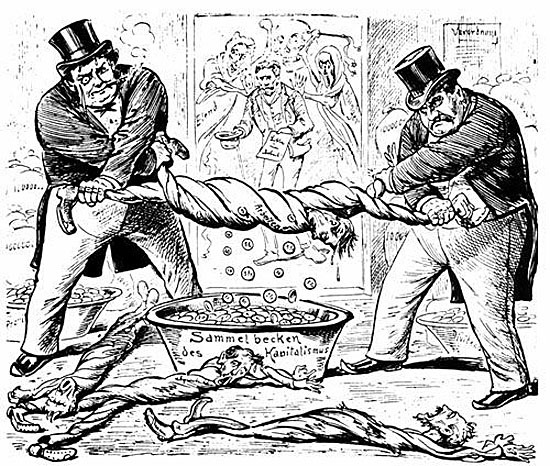 Therefore it is wrong, both logically and polemically, to define capitalism as “a system of competition” in contrast to socialism; let alone define communism – a system where individuals will have to compete for the favour of authorities who make decisions on their behalf – as a system of cooperation. We can’t see all of our friends all of the time, or even all of them at the same time. Even if we do, we are bound to have to split our attention between them. In addition to that we can only maintain so many close friendships at once, and we definitely can’t be friends with everyone. All of this means that inevitably we have to make choices. We each make decisions on who to make and maintain friendships with based upon our value judgements, conscious or unconscious. Perhaps based on how happy we feel around them, how long we have known one another, how much we have in common, how much we trust someone or how loyal they have shown themselves to be, how much they educate, enrich or enlighten us, or perhaps based upon what roles roles they allow us to fulfil in their lives. There can be countless other reasons. The fact is we decide. People who feel that they will benefit from our company, for whatever reason, will make attempts to spend time with us. We will invariably begin to make choices on who to spend time with based upon our values, schedule, and what other activities we are willing sacrifice to see them. These are basic facts of life, but they hardly make friendship a system of competition. Similarly, on the market, our time and resources are limited. We make value-based judgements about choices of products and services to consume based upon what utility we think they will bring to us, sacrificing some options to others. Maybe we will choose a coffee shop based on which has the best tasting coffee, or maybe based on which provides the nicest atmosphere, or maybe based on which is closest, or where the customer service is best, or which is the cheapest, or which we have gone to the longest and therefore find familiar, or perhaps even based on which we think has the best ethos – for example, because they are a social enterprise that only sells fair trade produce and deliberately seeks to employ and train disadvantaged people. The fact is we decide. Each service provider believes they will benefit from our custom and will make attempts to attract us, placing an upward pressure on the quality of services and a downward pressure on price which we may correctly identify as a form of competition. Since human beings are not infallible, sometimes someone might buy a coffee that they don’t end up liking, but over the long term the competition is likely to be won by the satisfaction of customers. The miraculous wonder we miss when we focus our attention upon the competition which derives from choice is the ability to choose itself. For example, supposing two commercial events are being held on the same evening. Each perspective patron will want to choose whichever event appeals to them the most, and for whatever reasons they choose based upon what they value in an event. Now, to simply mention that these events are “in competition” would be to completely miss the crucial point that event-goers (who are in the majority compared to event-organizers) have a choice of two events which they may prefer to go to one of rather than one alone. It is worth mentioning that there is actually far more cooperation involved in providing people with goods and services than competition. You have to cooperate with buyers, sellers, managers, employees, suppliers, customers, advertisers, promoters, marketers, collective buyers, and so on. Leonard E. Read (1898-1983), founder of the Foundation for Economic Education, illustrated this in his most famous essay, I, Pencil, first published in 1958. In it he noted that not a single person on the face of this earth knows how to make a pencil. He goes onto explain that the cedarwood is sourced from Oregon and the logs milled in California. The graphite is mined in Ceylon, mixed with clay from Mississippi, then treated with a hot mixture which includes candelilla wax from Mexico to increase its strength and smoothness. The six coats of lacquer come separately from the growers of castor beans and the refiners of castor oil. In fact, when you include those who manufacture and transport the equipment involved in these processes you cannot help but marvel at the fact that millions of people have a hand in its creation. They are working in concert, in cooperation, and as a result you can get a pencil for pennies. To the extent that it is free, the self-interest of the producer is subordinated to the hardly antisocial end of meeting the desires of others. A producer wins the competition only by organising a vast degree of cooperation in the service of satisfying the demand of consumers. This means producing things that regular people like you and I value enough to part with their scarce resources for. To the extent the government interferes in the market, firms are enticed to compete over government contracts, subsidies, preferential legislations, and so forth. This is a corrupting factor in the market as companies no longer have to focus on serving consumers but doing whatever it takes to beguile officials. Sometimes that may well be providing the best service, but this becomes far more likely as the end user is no longer the buyer. Instead they may lobby, bribe, or bait with promises of high paying positions for officials after they leave office. In my book Universal Basic Income – For and Against I note that according to The Sunlight Foundation, a non-partisan, non-profit organization that aims to make government more accountable and transparent, “For each of the 5.8 billion dollars spent by America's 200 most politically active corporations between 2007 and 2012 on federal lobbying and campaign contributions they got $741 in return in kickbacks and benefits. This poses a tremendous problem because as soon as it becomes more profitable for a business to lobby the government than serve their customers then lobbying will become their top priority. This is why government is often a corrupting actor in the economy rather than a referee. 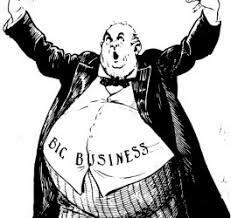 The mutual benefit of politicians and big business getting in bed together often outweigh those of serving the public. These incentives drive companies to misallocate resources by making products that the general public doesn't want profitable, and products that they do unprofitable. In other words, the government has become the client of these corporations rather than their customers.” The competition has turned sour. Those free-market advocates who extol the virtues of competition may point out that every service provider is, in one sense, actually competing with every other product that someone can possibly conceive of buying with their money, and argue that is a good thing as encourages firms to really try their best to create things that will please people in order to earn their cash and do business with them. Still, it cannot be said that capitalism is a system of competition – because competition is not the basis of the system, but choice. The freedom of consumers to choose gives rise to trial and error between competing service-providers attempting to draw a profit by catering broadly to as many consumers as possible or narrowly to meet certain niches depending upon their expertise and predilections. As human desires are infinite, there will likely always be incrementally more beneficial ways of meeting those desires, and thus infinite scope for innovation. What the market allows is for different producers to fill different niches. Buyers are able to compare the relative merits and drawbacks of competing products and vote with their cash on which they feel will better meet their needs according to their own values. Producers themselves are able to observe innovations in the marketplace and attempt to improve upon whichever products or services are already available. Customers will ultimately be the arbitrators of which models are successful and which will be weeded out the market. While there is clearly some competition in this process, overall it is a system of cooperation between buyers and sellers to reach a mutually satisfying voluntary exchange. In comparison to a centrally planned economy (or sector of an economy) where the amount of trial and error is very limited, and the state must roll out a one-size-fits-all solution scarcely tested against other possible solutions – a little competition between service producers might be worthwhile in exchange for a greater degree of autonomy and cooperative communication between service users and service providers which takes the form of supply and demand. The beauty of the free market, when it is allowed to function, it that it is a constantly self-correcting and self-optimising system. Producers can reflect upon what is available and look for gaps in the market, or improvements upon existing services, and the public will quickly be able to provide signals of what is serving them and what is not by which variations they choose to part with their money for. Over time this leads to a general improvement in the standard of service available to them and decrease in cost which is probably why most of the products we buy are pretty decent. If someone sells a faulty watch then we have somewhere else to go for watches. If we did away with choice in the name of eliminating competition, if there was a design flaw in one watch it would have already been rolled out to every store and it would be too late. What is more if someone could think of any small way to make the watch better, more accurate, more durable, more energy efficient, the new model would probably not hit the market for fear of someone making another improvement upon it making all of those obsolete as well. So to review, because people make choices with scarce resources and limited time, competition will be an inherent part of any economic system so long as there is scarcity. The primary feature of free market capitalism is not competition, but choice. Rather than moderate the amount of competition in an economy, state intervention will replace competition to serve customers on a voluntary basis with competition over gaining the favour of whoever is responsible for allocating resources within government. Instead of competing to serve their customers as best as they possibly can to achieve the biggest market share – firms can, will, and do, compete for government favours, and to have their products “rolled out” by the state to as many people as they can using public funds or subsidies out of the public purse. This is where the real “tooth and nail” begins. I remember seeing this cute little meme posted, without irony, on facebook a couple years ago. Clearly the fact that the picture highlighted the failure of a state program escaped the OP. More seriously though, it's hard to see how the removal of snow would pose any problem for the private sector at all. Some entrepreneur (or community serviceman reprisenting a nonprofit organisation) comes round the neighbourhood and asks if people are willing to contribute however much (or little) would be necessary to insure them against heavy snows. If necesseary, the organisation could draft a contract which says if the necessary amount of people to fund the program is not reached, the people who agree do not have to pay. Everyone who does pay up gets placed on a register, and gets a nice big siver snow-flake medallion to put on their mailbox or gate to show off to their neighbours that they have contributed. If some people can't afford to pay they can be offered a discount rate, or perhaps they could be included on register in return for agreeing to volunteer for the snow removers should their help ever be needed. If people choose not to buy into the system, when the snow falls eventually come, the company will drive by houses that are not on their register and don't have a snow medallion on display, or they will bill them out of pocket for a far larger sum than the original insurance fee to clear their driveway, offsetting the costs for everyone else. Perhaps they will think better in future. Even so, they will not necessarily be stranded - they can pay the neighbours children to take shovels and clear it like in the old days. Similar arrangements could be made for other services considered "public goods", like municipal garbage removal. For things like street lighting, which are near impossible to exclude those who do not pay for provision of, the medallion system would allow neighbours to apply social pressure to free riders without applying the use of coercion to subtract funds. Those who don't have theirs on display might attract disapproving looks, or have people round saying, "hey man, you are taking money out of everyone's pocket, when everyone pays, everyone pays less." With the technology we have today, it would be easier than ever to apply pressure to those who shirked the responsibility of sharing in the costs of local services they benefit from. The local shop could choose not to serve them and they may need to drive further to the supermarket which will not be worth the hassel of not buying a medallion. Their neighbours could choose not to allow them to collectively buy other services unless they paid in, meaning they would have to make their own arrangements which would prove costlier than choosing not to cooperate. Libertarians! You can't beat Something with Nothing! Here is a decent presentations on Libertarian Strategy and Psychology by me. According to a recent article in The Guardian by Polly Toynbee, The NHS is our religion in the UK and that's why the conservative government can't destroy it. Of course, the Conservative government has never actually tried to destroy the NHS. They haven’t even reduced the amount spent on the NHS. They haven’t even halted increases in healthcare spending. The only thing they have done is reduced the rate at which spending is going to continue to increase. Before the National Health Service was created in Great Britain, our nation was a world-leader with an unrivaled record in making major medical breakthroughs. People came from all over the globe to study medicine, and to be treated in the UK. Dr. John Snow proved that the source of cholera epidemics was the water supply in London. Edward Jenner pioneered a vaccine for smallpox in rural England, and Sir Almroth Wright one for typhoid. Sir Humphrey Davy, also a Briton, first suggested the use of nitrous oxide as an anaesthetic in 1800. Sir Joseph Lister pioneered the use of antiseptics in operations in 1865 using impure carbolic acid, saving countless people dying from infections after surgery. Alexander Flemming, the Scottish physician discovered Penicillin in one of the charitable hospitals in London in 1928. Howard Florey and Ernst Chain, brought it to fruition working in a laboratory in Oxford in 1941.1 Britain had established the best record in the world for achieving major medical advances and had just developed the landmark drug of the 20th century, as well as playing a leading role in 5 out of the 7 leading medical breakthroughs between 1750 and 1948 when the NHS was established.2 Britain is no longer a leader in medical advances. Despite its costliness, nepotism, and other flaws, America’s private system has taken the lead. Britain has less of the latest equipment and the old equipment is often being kept beyond the time when it is safe.3 If a private company was using out of date intensive care machines and x-ray machines, obsolete cancer care equipment, and operating tables over twenty years old – double their safe life span – the champions of the NHS would no doubt be clamouring for more government oversight and regulation. When government agencies are culpable, they are more or less given a pass on public outrage because they are perceived to be acting in the public interest rather than for profit. In the UK we cannot compete with cancer survival rates in the US. A 2011 report demonstrated that the average cancer survival rate was 71.18% in the USA as compared to 54.48% in England.4 Our healthcare may be free at the point of service, but fewer of us survive it. It is costly in terms of lives. In fact, the BBC recently ran an article that reported “patients ‘dying in hospital corridors’.”5 In one month 300,000 patients were made to wait in emergency rooms for more than four hours before being seen, with thousands more suffering long waits in ambulances before even being allowed into the emergency room. 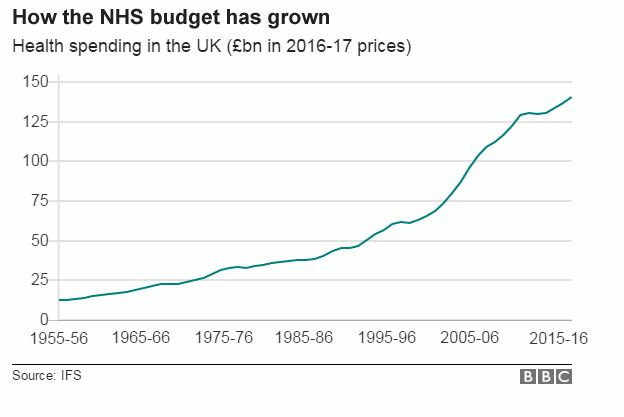 In fact, the budget of the NHS doubled in real terms between 1995 and 201517 and now waiting lists are longer than ever! This is because the shortages and inferiority of services are not caused by a lack of funding in the first place. They are caused by how we are choosing to pay for healthcare. If you are interested in receiving and advanced copy of my eBook Why Healthcare in America is so Expensive, please email me at frequency528@hotmail.co.uk to let me know. 17 Author Unspecified (2015) “Health Spending”, The Institute for Fiscal Studies. Can Government Make a Business Run "For The Good of Society" ? The New York Post recently reported that a judge in Indiana has temporarily barred Starbucks from closing 77 Teavana stores that were failing because "the very profitable Starbucks could absorb the financial hit". Industry experts said the ruling will send a chill down the spines of distressed retailers, and with good reason! The prospect of not being able to shut down an outlet that is bleeding the rest of the business may have countless unintended consequences that will affect not just owners but consumers in general. Firms are likely to take this as a signal to be more cautious about opening up new stores, and become reluctant to invest, take risks, and employ people in the first place. Customers stand to lose. Amidst the debate upon the justice of the justice in question, I heard a voice clamour, "The question is not of profit, but whether a business should be run for society or society should be run for business!" and to be quite frank the claim struck me at first as vacuous; professing much while saying very little. Yet we must admit that throughout history many governments have believed they were "serving society" (rather than the business community) by forcing companies to fix prices, continue operations at a loss, or even subsidising or bailing them out with public funds. Many have believed this is in the interest of "the greater good." Could it be that government forcing Starbucks to maintain unprofitable stores - in some circumstances - would be good for society? It's not that keeping a Teavana open despite the owner's desire to close it won't be good for anyone; clearly the proprietor of the shopping centres is willing to fight hard for what they stand to gain, and certainly regular patrons will be happy to be able to get their regular cup of chai before leaving a hard-days-shop. However, the point is the move privilege a few individuals who want to continue going to those outlets at the expense of everyone else in the area who has demonstrated that they would rather something else opens up in that space instead. Starbucks then will need to recuperate the loss somehow or other, perhaps by increasing prices slightly at all other locations. If the locality can only sustain the demand for three tea houses and the unprofitable Teavana happens to be the forth then they are also bleeding demand away from the other three, and so on. We can continue counting negative consequences to other parties. If Starbucks are deprived of however many millions it costs to operate 77 unprofitable stores that is less money they have to invest in stores that are wanted by enough people to keep them afloat. It's less cash for shareholders who will take it out to the shops to spend it or reinvest it in other businesses, it's less for Starbucks customers who have to pay slightly more for a cup of coffee and therefore don't have to spend on something else, it's less for Starbucks employees who might have to forego a raise because there is less to go around..
Clearly the effect of this policy is not something that can be broken down into whether it ‘benefits society’ or not. All we can say is that it benefits some groups and harms others. It seems ironic to me that most of those who will cheer on the judges ruling, forcing Starbucks to run 77 tea outlets - against their own interests - for the interests of others are probably the most likely to complain when a Teavana opens up that it will "drive out" locally owned tea houses (which are probably actually collapsing under the strain of the regulations they have to comply with, not being able to afford Starbucks team of expensive lawyers and accountants.) If anything you'd think this crowd would be cheering on the closures! As they carry with them a certain prejudice that whatever vexes big business is necessarily good for the rest of us, we can only conclude that supporting the ruling is less about what is good for society and more about what is bad for Starbucks. It's still a very prevalent view that employers are somehow exploiting the people who work for them when they draw a profit from their business, despite the fact that a person's employer is clearly doing more for their finances than all of the people who are not employing them. I might add, perhaps somewhat facetiously, including those keyboard-warriors who claiming that entering someone into employment is exploiting them. It is true that workers do get paid less than the total value of what they produce, but that is because what they produce is made with other resources which have to be bought, and in a factory or work place which has a price and requires overheads to operate. The capitalist is responsible for paying for marketing and advertising to link the product to potential buyers - and at the end of the day, if the product doesn't sell, everyone else has already been paid but the capitalist walks away with the loss. The capitalist lays out a vision of what he thinks will meet people's needs better than they are being met at present. This requires a particular expertise which is in itself a labour contribution over and above that of the other employees which is unique to the entrepreneur. If his vision is clear, indeed he will make a profit. If it is faulty he will make a loss. This is not a necessary risk, absent the profit motive a rich person is more likely to buy a bigger house or go on a cruise. But the capitalist takes a risk now, and foregoes consumption, in hope that he will reap the benefit later. That is part of what he is being paid for. Another part of what he is being paid for is the time between making the investment and getting paid for that investment. We would all rather have resources in the here-and-now than some time in the future, because the future is uncertain, that is why lenders can charge interest on money that they borrow. They are choosing to forgo a smaller amount of consumption now for a larger one in future. The workers get paid now, the capitalist gets paid later only after the product has sold, and only IF it is sold, after everyone else has been paid. Austrian Economist, Eugen von Böhm-Bawerk explained that far from exploiting labour, the capitalist removes the burden of waiting for income from the workers. If they wanted to produce the goods themselves they would also have to wait until they could find a buyer before gaining a stable wage, and first save or borrow in order to accumulate the resources to buy a factory or workshop without the help of the capitalist. Finally, it's worth mentioning that the capitalist is increasing the value of the workers labour! If a man decides to try out the same manoeuvres which might get them somewhere in a factory out in a field it will not produce much of value to anyone else. Clearly workers can earn more working for their employer than for themselves otherwise they would simply declare themselves self-employed and get on with making a higher income. Perhaps some of them can earn more working for themselves but do not want to take on the responsibilities entailed which are currently met by the firm which employs them. This too is evidence that capitalists are providing value. Marxists hold that capitalists simply skim their profits off the top while providing no value of their own. That they are "extracting surplus value" from their workers. But if that was true, non-profit organisations would just swoop in and undercut profit-making firms by eliminating the "dead weight" costs of paying a capitalist. They do not because they cannot. Capitalists are clearly providing some competence or vision which benefits their workers. Each benefits from the mutual exchange, as evidence by the fact that if the worker could get a better deal s/he would take it, and if the employer could find a better worker s/he would hire them instead. Ultimately, wages are not an arbitrary figure but a reflection of how much value an employee is able to provide to a customer. If a person wants to do away with an employer they can do so by learning skills, either on the job or on the side, which will allow them to work for themselves. Likewise, profits are not arbitrary but a reflection of how much value a company is providing on the marketplace. Provided - of course - that they are drawing their profits from serving the market place rather than lobbying or appealing to the state, but that is another article. "In order to show that it is a half-truth, we must have recourse to long and dry dissertations." The Austrian Economist Ludwig von Mises (1881-1973) authored his Magnum Opus Human Action (1949) in which he laid out his case for laissez-faire capitalism based on a rational investigation of human decision-making. Mises, and the work by extension, is often maligned for "rejecting the scientific method" but this criticism is based on a lack of understanding of Mises' arguments. Admittedly, while few of his critics have read the man himself, Human Action was not exactly written with a lay audience in mind and so the basis of his ideas cannot be easily grasped at a glance. In the interests of clarity, allow me to make his case for him in my own words. Mises did indeed attest that the empirical method (positivism, or the scientific method) is not the correct methodology for reaching reliable conclusions on matters of economics. However, he did not reject the scientific method. He merely pointed out that the empirical method is ideal for matters of the natural sciences because when it comes to inanimate objects results are predictable. This is because the natural world is deterministic. Copper always melts at 1,085 °C. That which does not melt at 1,085 °C is not copper. Human beings, however, have differing values, tastes and information all of which strongly influence their decision making. Will a person buy a hamburger at half price? Certainly many more will than at full price, but for example I will not because I am a vegetarian, whereas some others may buy several times as many. It all depends on their individual ideas, expectations and preferences. When it comes to matters of economics there is no way to set up an experiment and control for all factors as we can in a laboratory. We cannot, say, increase the minimum wage in one region to measure the effects on overall employment and compare it to the effects in another region where it is not increased, firstly because the implementation (or lack of it) in one region will also affect the behaviour of individuals in the other (some may move to take advantage of higher wages, others may stay to take advantage of cheaper labour costs.) Secondly because an economy is complicated, and thousands of other factors would also be at play in both regions which cannot possibly be controlled for. We cannot say (for example) that just because employment rose in one region after a minimum wage increase that this change was due to the minimum wage increase, only that it happened. Because we have no counter-factual there is no way to tell if employment would have increased even more if the minimum wage increase had not been enacted. In light of this, Mises attested, a more suitable method of approaching economic questions would be necessary than the empirical one, based upon the foundation of certain axioms about human nature which could be reached by introspection (or thymology as Mises labelled it to distinguish from different uses of the term introspection.) In the interest of brevity and simplicity we only need to consider three of these; and I will explain why each should be uncontroversial. The first is that humans act. This claim is hard to argue against because the very act of doing so would be to make a performative contradiction. The second is that when people act, they do so in order to substitute a state of affairs which they consider preferable for one they consider less preferable according to their own values. Again, I see no argument against it; if one is completely satisfied with their situation as it is they do not act but stop. Even the attempt at meditation or mindful acceptance of the present moment is based on the impulse to substitute a pleasant state of surrender to circumstances outside of ones control for a less pleasant state of resisting them. Finally, I add, that people respond to incentives. This axiomatically true because what people do not respond to can hardly be considered an incentive by the very definition of the word. An acceptance of these three axioms (for which their is unlikely to be any disproof) reveals that it is incentives which guide economic decision making among individuals. This we all accept, if not in our conscious philosophy then by our actions. To illustrate with our earlier example of the half-price hamburger, the business owner offers this deal in the hope of selling more burgers by creating knowledge of his product. A person buying the burger at the lower price incentivises burger joints to offer burgers at a lower rate. (One might argue that not everyone will respond to incentives, illustrated by the fact that I will not buy the burger because I'm a vegetarian - but in fact in my case the incentive is simply not great enough to suit my values; were the price of the burger was -$10 [minus ten dollars] I might take the money and give the burger away to a homeless person.) Our policy-makers are often led by their unconscious acceptance of these axioms, for example, they may put a tax on alcohol do discourage its consumption, while placing a subsidy on a solar panel to encourage its use. These are not policies guided by the empirical method which is better suited to the natural sciences, but by the aprioristic understanding that humans act, and in their actions they respond to incentives. That is the method, named praxeology, which Ludwig von Mises advocated. Slavery did not advance Western Civilisation. Every now and then someone will say something like "Despite the fact that slavery was immoral the modern world was build upon slavery and we owe the lifestyle we enjoy to the sacrifice of slaves..." Sounds compelling - except its not true. Slavery held back the advance of civilization because its pointless to innovate, invent or automate when you have (free) slave labour. Absent slavery the agricultural revolution may have begun decades earlier. Slavery was an abomination, and positive ends can never become of corrupt means. Hello, and welcome to my blog. I am a freelance economist who specialises in explaining economics 'the dismal science', in a non-academic fashion. I find these concepts fascinating, beautiful, and elegant but having read widely I confess the coverage has so far been pretty dry. I am trying to remedy this. As a political economist I make no great claims to originality. Occasionally I offer a new angle, analogy, argument, metaphor or illustration, but my primary virtue is my ability to communicate in full, clearly and in short; what others have already communicated in part, vaguely and at length. I would like everyone to enjoy seeing the world more clearly as much as I have and I believe economics, the sacred science of human action, has the ability to do that. Seeing the Unseen, the title given to this blog is after an essay from my favourite writer on economics, Frederic Bastiat, entitled, "That Which is Seen and That Which is Not Seen." He, like me, was largely a sythensizer and populariser who further developed and explicated ideas that were already circulating in economics - but what a gift and a talent he had for both clear writing and thinking.